With what appeared to be luck after a long season, I found myself at full draw on what would be the most memorable hunt of my life. September 21 started as a normal morning of hunting. Waking up to chilling temperatures after a restless night, I had hopes that today could be the day. The series of events leading up to this point started months earlier and miles away, with a group of like-minded men. My new found group of elk hunters… just in time for elk season 2018! June 11 was finally here as I stepped through the front doors of the Colorado School of Trades. Surrounded by strangers, who would soon become some of my closest friends, I tried to wrap my head around all there was to learn and become a part of. The years prior, arguably a lifetime, lead me to this place in time. Growing up, immersed in shooting and hunting, made the thought of a career as a gunsmith very enticing. After speaking to the staff at the school my mind was made up and my bags were packed. 1900 miles, from my hometown in PA, I found myself in Lakewood Colorado. Like any young man aspiring to build a life for himself, I was ready to work hard and full of ambition for the future. Months into the Gunsmithing program, things were going well and I had become friends with a group of truly hard working men. Having come from all different parts of the country there was one extensively binding similarity. The drive to hunt. The talk of Elk season, being only months away, filled our free time and the planning slowly came together. It was an east coast hunter’s dream! The trucks were packed, bows were tuned, and the endless hours spent breathing through an elk call had us feeling confident. As if watching the bloopers to a movie, the first weeks of the season came and went. 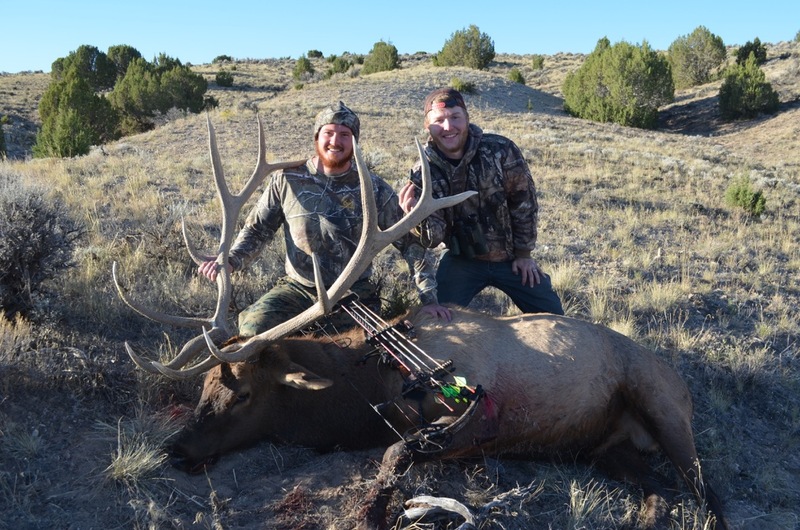 The opportunity provided itself almost as quickly as I, being a first-time elk hunters, could navigate around the 360-degree learning curve. Note to self, Elk learn quickly, they move and they move far. Mistakes were made but none the less we were learning and enjoying it. The season continued with its share of highs and lows blanketed by the comradery of my new found fellow hunters. As we drove down the dirt path on the morning of the 21st a slight solemn was in the air. It was the last weekend of the season and the morning prior had me thinking about how we could have done things differently. We had called in a legal bull and in the closing minutes with the taste of success already in my mouth, he spooked. With a small part of my pride, he was gone as quickly as he arrived. Putting that in the back of our minds we arrived and began the morning hunt. The air was cold and the wind was in our favor. After glassing hillside after hillside and serenading the valley with multiple calling sequences we debated our next move. “Stop! Everyone get down!” as if dropped out of midair Dylan had spotted a big bull on the hillside to our right. We let out a bugle and a few cow calls only for him to look us off. In near disbelief, I retreated to cover behind a tree. The minutes that followed were full of mental preparation and questions quickly answered by the chuckles coming from the valley below. Before I knew it he was in my lap and I hadn’t even drawn back. Less than 20 yards away the bull stood. Face to face I had to make an immediate decision. He had me picked out and I drew my bow knowing the inevitable would likely happen. Sure enough, he spooked and ran. Now I’ve made running shots on deer before and I’m fairly confident with my bow. Without hesitation, I steadied and prepared to release knowing well that the next split seconds would determine my ability to sleep for weeks to come. As he trotted broadside about 45 yards in front of me, Brendon, the only experienced elk hunter in our group let out a cow call. The bull stopped just for the split second I needed. I released. The illuminated knock shined like the light at the end of a tunnel as the arrow made its way to a perfect shot. After a short run, he expired and the real excitement started. There he laid, Less than 100 yards away in the bottom of a small ravine. The joy and happiness I felt as I got my hands on him for the first time is not something easily explained. As I sat there next to him the respect I have for these magnificent animals, and the men who dedicate the immeasurable effort to pursue them, multiplied tenfold. Even though I was the lucky one who got to take the shot, this hunt was as much a team effort as anything. The week after I brought the 6×6 rack to school where the story of the hunt was retold countless times. Using a tape measure and some extra hands in the parking lot, we scored him at roughly 315″, well beyond my expectations. I would venture to say that Brendon, Gus, Dylan, TJ and myself, in some way, got what we were looking for. A newly bonded brotherhood and an experience that we will remember for a lifetime. What Is the Attraction to AR-15’s and Building Them?